2>1 after all. 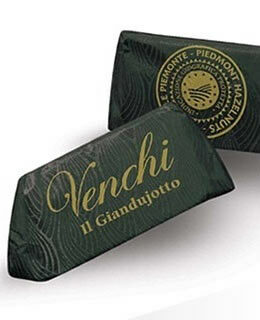 Venchi resulted from the merger in the early 20th century between Talmone and Moriondo & Gariglio, both among the pioneers of gianduia in Turin, Italy. Top-line culinary media. Ideal balance, integration, & scale. Chocolate & hazelnut form a supple dyad. Venchi's 56% Ecuadorian cacáo beautifully blended into super fresh nut meats, expertly roasted to express essential / massage oil quality for extracted / concentrated clarity. One more exhibit on why Piedmont filberts earn their name, fame, & fortune. Best in category & too outsized to put in the Boxed Chocolate section. Among the best chocolates in the world, period.